Why is W Abrasives unique? W Abrasives is an innovative and eco-friendly solution provider that listens to the voice of the customer. By asking the right open-ended questions, W Abrasives strives to fulfill customers’ expectations and demands. Our customer needs to get stable quality products and reliable deliveries. With 11 plants around the world, W Abrasives is a High Carbon Manufacturer that can address any blasting requirements from customers, wherever they might be located. We make no fake commitments, and engage in providing the best value for money: high quality products, reliability and complaints management. Our customer needs a salesman who knows him, what he wants and what he may like in the future. W Abrasives recruits, trains and motivates the best people in order to build up intimacy with customers. Through a reliable sales team, we want our customers to feel recognized and important. That is why we reward them for being loyal. Our sales teams follow a strict visit process in order to achieve our unique objective: improve our customer’s performance. Our customer needs a company that can optimize his costs and efficiency. Thanks to its Test Centers, W Abrasives teams up with customers to optimize their processes progressively without big investments. Our customized and exclusive offers – cost calculations & technical expertise – allow customers to work out their blasting and cutting parameters efficiently. Our training solutions enable operators to beef up their knowledge of and involvement in the blasting process, thus enhancing and strengthening their position. Our customer needs a company that gives him a competitive edge. W Abrasives wants to make its customers the best players on their own markets. 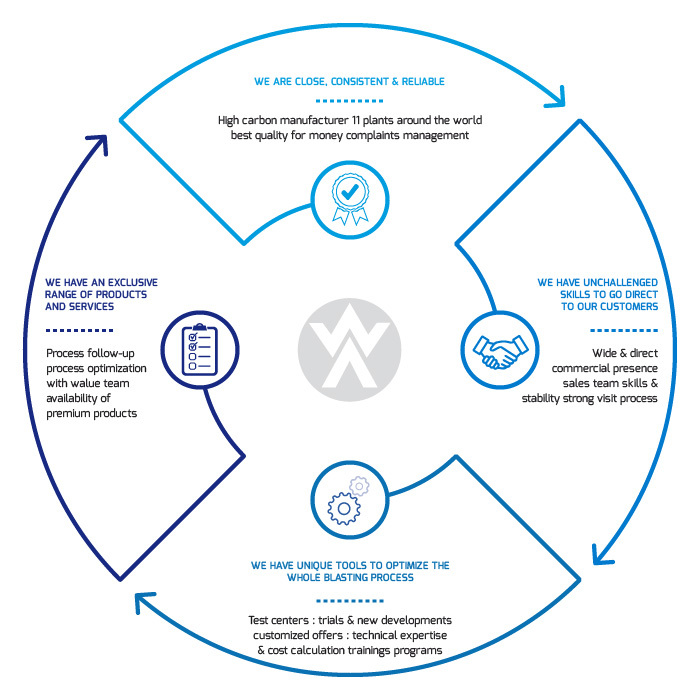 Thanks to an exclusive range of Premium and Specialties products, we give customers unique assets to optimize their process efficiency. Premium solutions are supported by a worldwide dedicated team of 25 Application Experts, specialists in technical expertise and cost reduction.